Happy New Year, yogis and yoginis! I hope that your holiday season was amazing, and that you had a festive and fun New Year’s. If getting into yoga is a part of your new year plan, but the idea of squeezing yourself into a packed studio makes your skin crawl, or if carving out 90 minutes to two hours from your day on a regular basis is just not doable for you, fear not! There’s a plethora of ways that you can fit yoga into your life, without ever stepping foot in a yoga studio. Here are my top five easy ways to start your New Year with yoga without going to a studio. 1. Start with Sun Salutations. Here is the deal with asana practice—any amount counts. You don’t have to dedicate an hour or more of your time to a physical practice for it to be worth your while. In fact, if you are just starting out, I’d even suggest you start with shorter practices, and work your way up to longer sessions as you go along. 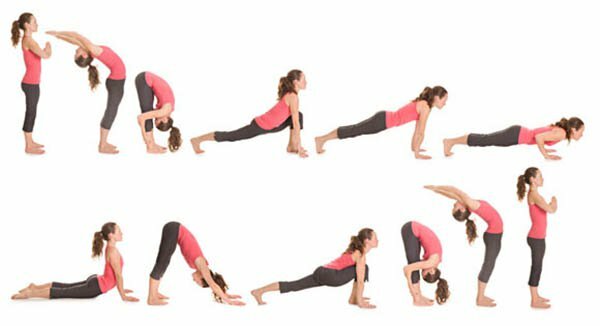 Starting your day with a few rounds of Sun Salutations is an awesome way to wake up your body, get your blood flowing, and get you off on the right foot with yoga. If you are unsure how to do a Sun Salutation, here is a video for you. YouTube is an amazing resource for really good quality, shorter yoga sequences that you can use right in the comfort of your own home, whenever is convenient for you. I used to be a real stickler for the idea that it was important to go to a studio with a real live teacher when first starting out in the yoga practice—and I still believe that there is huge benefit to practicing with a teacher present—but if you're not able to do so right now, then YouTube is your friend! Checkout videos by Tara Styles, Kino MacGregor, and Mackenzie Miller for some awesome sequences to get you started. I also highly recommend Rodney Yee. 3. Do some breath work. Keep in mind that asana is only a small portion of the larger pie that is yoga. Breath work, also known as Pranayama, is an equally important practice that can help you cultivate better body awareness and focus, decrease anxiety, and draw you into your present moment. Starting or ending your day with a short breathing practice is an awesome way to integrate yoga into your day, without spending too much time or energy. One of my favorite practices to start with is the ‘3-3-3-3 breath.’ Simply inhale for a count of three, hold the breath in for a count of three, exhale for a count of three, finally holding the breath out for a count of three. Do this for 10 rounds, and see how you feel! Once you get comfortable with this, you can increase the count to four or five, and you can increase your number of rounds as well. 4.Begin a simple sitting practice. Along with Pranayama, seated mindfulness is another huge part of yoga. Contrary to what you may believe, you don’t need any formal training in the art of meditation to start a sitting practice. Simply find a comfortable position where you can sit or lie comfortably for five to 10 minutes. From there, you can utilize a few different techniques for drawing your mind to your present moment. One great tool is watching the breath. Simply draw your mind to your breathing, and watch as you inhale and exhale. If your mind wanders away, simply bring it back to your breath. Another great tool is scanning your body. Start by drawing your mind down to your toes, just noticing what you feel (or do not feel) when you focus your whole awareness on your toes. Then, move to your feet. Then your ankles, your calves, your knees, and so on, all the way up to the top of your head. These are both short, easy practices that can be done any time of day that will offer you great benefits. 5. Start with the Sutras. Finally, getting yourself a copy of the Yoga Sutras and making it a part of your day is a wonderful, non-physical way to integrate yoga into your life. The sutras are composed of several short verses, which usually come with a translation or commentary. My suggestion would be to read one sutra a day, and then do a little reflection or writing on what it means to you. By doing this practice, you will be tuning your awareness to the greater picture of yoga, tuning in with yourself, and unifying with the ideas of the yoga practice in general. So what do you think? Are you excited to try any of these practices this new year?